I say unto you ALL, as-salaam alaiKUM. Dearly beloved people, our life and community are at risk. Our distinguished identity as Muslims in America is at risk. Those charged with leadership among us, the majority of them not all, are risky characters. They, for the most part, have refused a serious, open discussion about our leadership. What has distinguished us as a people has always been our leader. His life, his commentary, his manner, his insight, his courage, his intelligence, his wisdom, his vision, his knowledge, his judgment, his firmness, his kindness, his faith, his universal appeal has made for us an Islamic identity. From the time of our first leader until his passing we have had representation. Even the late Honorable Elijah Muhammad said when asked who will succeed him, "no one will... only Allah," while knowingly nurturing and grooming Wallace D. Mohammed, his special son for the great task. We have Imams in every major city in America but no leader that is commonly held by the will of the people to advance our collective interest. I believe that Imam W. Deen Mohammed intended that none of them be seen as qualified because none of them are. Their selfishness, back-biting, ill-will and deceit have disqualified them. But more than that their emphasis on matters other than those matters IWDM placed emphasis on while he was here with us disqualifies them. How many countless times did IWDM question their loyalty in public? And now some of them claim to have vital, yet confidential information about IWDM's intent for the future of the community while others want to make side concerns the most important matters. Dearly beloved people we need an open discussion about our leadership using the guidance that our leader showed us and taught us. Please enlist your thoughts and convictions here on this blog so that we, our people, are not erased from existence choosing inferior paths like Minister Farrakhan's NOI, or the immigrant community leadership, or the black salafiyah community, or some other leadership that is not in our tradition. We are a unique, special people with a special mission distinguished for us. We must challenge ourselves to stand up and push forward as a viable people. The only way is that there is open, truthful discussion based in good, honorable intent about our leadership. There are more voices to be heard than just NYC-Manhattan, Dallas, Atlanta, Hazel Crest, Washington DC, and Indianapolis. 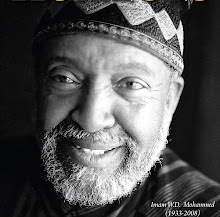 There are many who have had personal interaction and serious discussion with our leader Imam W. Deen Mohammed. We owe it to our former leaders and their selfless, successful work to seek out all who have something to contribute to this discussion. Our lives, our people, our special group identity is at risk. All contributions are welcome. I say unto you, PEACE!